Phil Rosenthal is the creator if the hit sitcom, “Everybody Loves Raymond.” The show was so successful that soon after the series ended in the United States, Russia called to make their own version. When this happened, they asked Rosenthal to travel across the world to help this Russian sitcom become a reality. When he was asked to write about this experience, to possibly create a fictional film about the process, Rosenthal simply asked to instead take a small film crew and make a documentary instead. The result is pure comedy magic. Most of the humor in the film comes at the frustration of Rosenthal, as the Russians seem to disagree with him about many things. They don’t share his sense of humor and many even find the series completely unfunny. Still, Rosenthal prods along and continues to insert his opinion. The costume woman insists that the wife in the show be an icon of fashion for Russian women, the actor chosen to play the main actor is unable to carry the show, and there are studio heads destroying options at every turn. Still, Rosenthal doesn’t give up his mission, and he sincerely seems to care about the people he meets along the way as well. 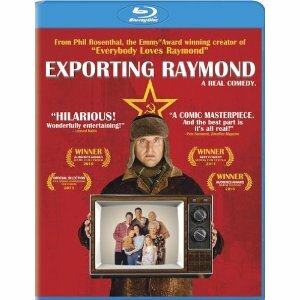 The Blu-ray includes a comparison between “Everybody Loves Raymond” and the Russian counterpart, “Everybody Loves Kostya.” There are two Russian and two American episodes, each using the same script. There is also a commentary track on the documentary feature with Rosenthal, often talking over his own narration in the film. There are also deleted scenes and a theatrical trailer.